I woke this morning to find - much to my delight - that it had snowed overnight. As a Canadian, I love the snow. In fact, I love winter. I love bundling up in a warm coat, winter boots, and a tuque and walking as the snow crunches beneath my feet. However, I have come to love winter only in Canada as seemingly, Scotland is unable to cope with this weather. 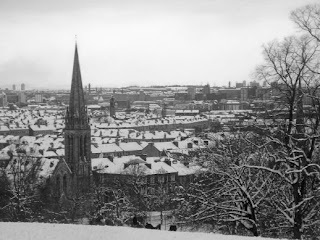 How is it that Glasgow, a city which is nearly the same distance from the Equator as Moscow, comes to a halt when a light dusting of snow pervades the ground?! Over the course of the Christmas break, I came very close to slipping on the sheet of ice, which permeated the sidewalks across this city. It was then that I realised that it wasn't Glaswegians who were to blame for the static pace of the city but rather, Glasgow City Council. Despite Glasgow receiving a massive dumping of snow every four years, it appears that the council still has yet to invest in snow plows for the road. Or ice/ grit dispensers for the sidewalks - leaving many frustrated Glaswegians. Normally I would love this weather but after almost killing myself while walking to work, I'm anything but delighted by this winter wonderland. I love how snow halts everything here. We have the fewest number of bank holidays in Europe. We deserve the time off. It's great to go out in the street and there is no traffic, no noise, no work. Awesome. All of this ... is intimidating. We've been gone for 6 weeks; to picture such a radical change is difficult.